It’s the Ohio big buck story that’s taking the internet by storm! No, it’s not a new world record, or even state record for that matter. And no, this is not another poaching story. This is the story of a man who shot a high-fence monster and supposedly tried to pass it off as free range. It is a story of twists and turns that just gets more interesting as it goes. In all fairness, details are somewhat limited and a lot of the evidence is based on hearsay. Yet, at the same time, a lot of what is being said has been backed up with some proof. However, I want to point out that the man behind the monster has still not come out to confirm or deny any of the details. So, let’s start at the beginning of this crazy tale. On December 2, 2017 pictures of a true Ohio monster began surfacing on the internet. This giant was supposedly taken in Carrol County, Ohio by a man named Ronald Lidderdale. The internet was all a-rage with pictures of this 280 inch beast. But, of course, as with all bucks of this magnitude, speculations and accusations began. Not many hunters were convinced this was a free range buck. And, this is where the first twist comes in. People were claiming that Mr. Lidderdale tried to pass this buck off as free range, stating that he even went as far as to remove the buck from the high-fence ranch that he shot it on, and then took it out to the land where he normally hunts, and then even got the landowner help him find and load the monster. So, is any of that true? Did Mr. Lidderdale really try to pass of a high-fence deer as free range? Well, I’m going to play devil’s advocate here. I have seen no proof that Mr. Lidderdale did any of these things. This is where the hearsay really comes into play. I cannot say with any certainty that these statements have any merit. And, I realize a lot of people may not like that view point, but I still believe in innocent until proven guilty. So, until someone is able to prove this story 100% with hard evidence, I will give Mr. Lidderdale the benefit of doubt. Okay, so the next twist to the story, and one that has been backed up with proof; yes, this 280” buck was taken on a high-fence ranch. 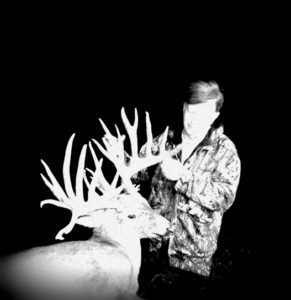 Interestingly, Xtreme World Class Whitetails of Ohio released a picture of this buck (still on hoof) on December 3, 2017, stating that the picture had been taken the week before. People instantly recognized this as the Ronald Lidderdale buck, and Xtreme World Class Whitetails of Ohio did confirm that the buck was taken by Mr. Lidderdale on their ranch. They have made no official statement that I am aware of, but proof has been flying around the internet ever since they made a comment on a Facebook post. So, why no statement? I’m not sure, but it just seems too convenient that they would post the picture of that buck the day after it had been taken. Maybe the picture itself was the statement, their way of letting everyone know that the buck came from there. As if this story isn’t interesting enough already, there is one more final turn. 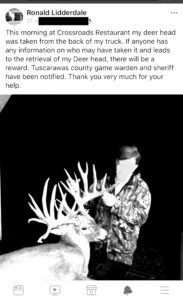 Yesterday, December 4, 2017, Mr. Lidderdale made a post on his Facebook page that the buck’s head had been stolen out of his truck while he was at the Crossroads Restaurant. This, too, has led to a lot of speculation and more accusations. Mr. Lidderdale has been accused by many of faking the theft of the deer head; people are really struggling to believe anything this man says. 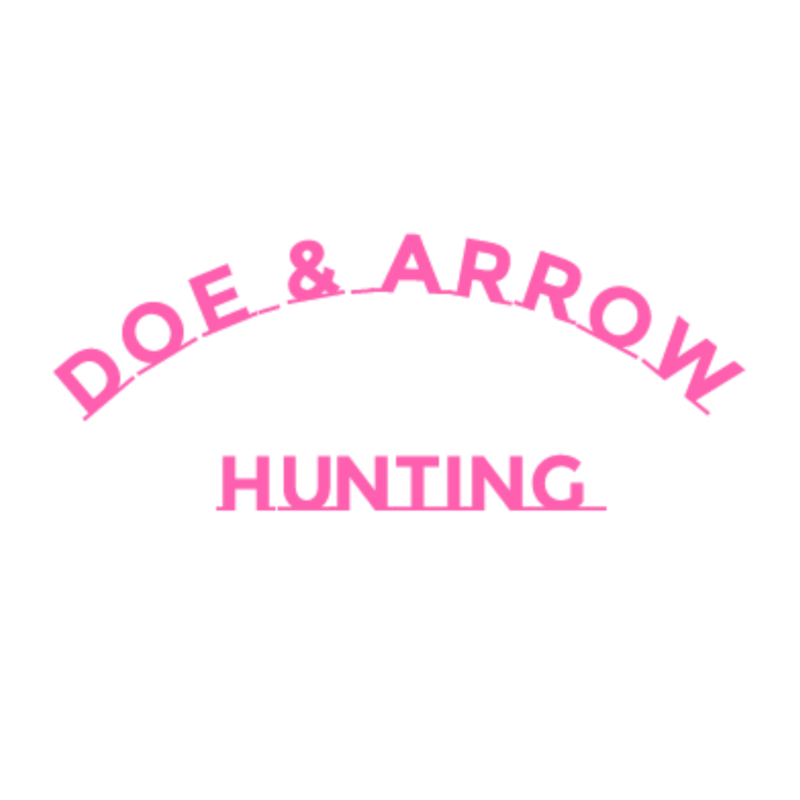 I can definitely agree with the point most hunters are taking on this one, “I mean, who leaves a 280” trophy deer head in the back of their truck?” Yet, at the same time, I truly hope that it was not stolen. And if it was, I hope it is recovered, because, regardless of whether or not it was shot free range or high-fence, it belongs to Mr. Lidderdale, and it is his trophy. We do not have to like how this buck was taken or how the story unfolded, but just as deceit is wrong, so is theft! So, is there more to come in this crazy Ohio deer tale? Who knows? 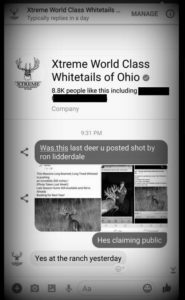 I can only hope that at some point Mr. Lidderdale, or even Xtreme World Class Whitetails of Ohio choose to make an official statement. I will continue to follow the story and make any updates if they become available. Though, in all honesty, I’m sure Mr. Lidderdale is hoping that this story soon goes away, and it may do just that. In closing, I would love to know your thoughts on this story. And, yes, I realize that the majority of you are angry and may not like the view I took. But, with no facts to support all of the accusations, I cannot allow myself to take any other stance on the situation. Please leave your comments below, or feel free to contact me at kls2703@yahoo.com.